Flymaple is a Quadcopter controller board, based on the Maple Project. The FlyMaple embeds a STM32F103RET6 (ARM Cortex-M3) as it's main MCU. It integrates a 3-Axis accelerometer,a 3-Axis gyroscope,a 3-Axis compass and a barometric pressure sensor. By using the 10 dgrees of freedom IMUs and powerful 72MHz high-performation microcontroller, flymaple is powerful enough to handle a complex algorithm and manage a robot motion system at the same time. 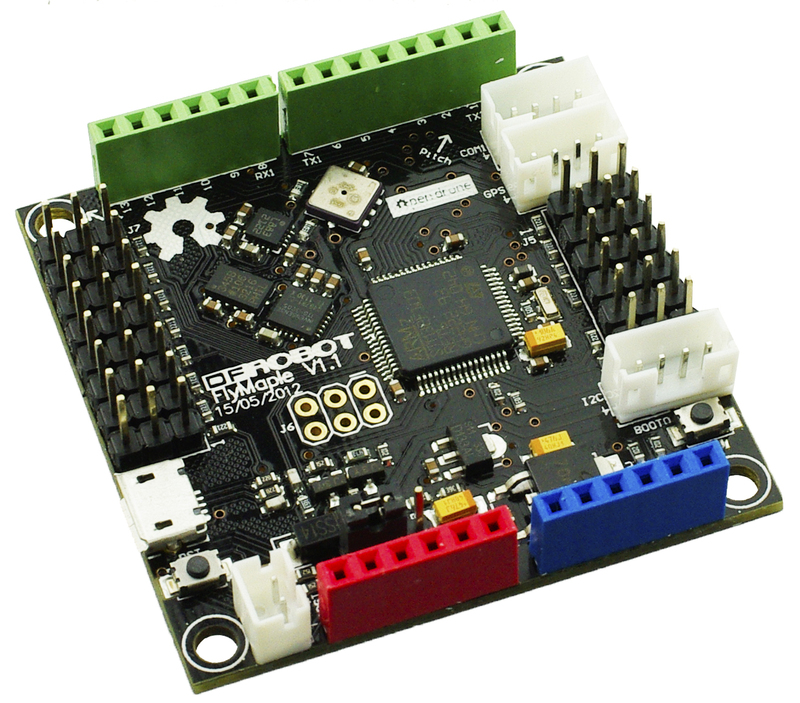 The design of flymaple is based on the maple, which is an arduino sytle ARM processor. The Maple IDE will make Processing/Arduino programmers feel right at home. If you're familiar with Arduino then you can get started with the Maple IDE quite easily. Flymaple is aimed to run on the balancing robots,mobile platform,helicopters and quadcopters which require IMUs and high performance real time controllers. It has an amazing scalability, because it's compatible with the Arduino shields. FlyMaple extends 6 PWM channels and 8 channels for GPIO for controlling ESC/Servo and capturing RC receiver input. Switch Maple board into continuous Bootloader mode (hit reset until you get the fast blinks followed by slower blinks;and immediately hit and hold the boot button until it changes into slow blink mode,release). It should show some broken USB device in your Devices, not a com-port. Download the Maple IDE for windows(http://static.leaflabs.com/pub/leaflabs/maple-ide/maple-ide-0.0.12-windowsxp32.zip),and extract somewhere. Select manually select the driver location, select Maple IDE directory "maple-ide-0.0.12-windowsxp32/drivers/mapleDrv / dfu directory, to install the driver. It also supports WIN 7/8 64-bit. Note that while these instructions work on Windows XP, changes in Windows 7/8 mean that you won’t be able to install the IDE without disabling driver signing on your computer. Click through the dialogs, select maple,and the default values should be fine, or you can fill in some descriptive info. Save the INF and have it install. It'll produce a big red prompt about the driver being unsigned and problematic; however, it will still work. "Update" the MAPLE 003 device in your device manager and select the INF file you generated. Run the Maple IDE, when you hit the Upload, hit your Reset button on your Maple Board. It should detect and load the data on it. If your compile takes too long, try hitting the reset later in the upload. I used an alternating interval blink to prove it was working to me instead of the straight blink code. The serial drivers that came with the Maple IDE package do work fine, so you can use those drivers for the COM port directly. This sample code is a piece of the whole library code for the motor functions, you need to download the library to run the whole sketch which contains this motors code. 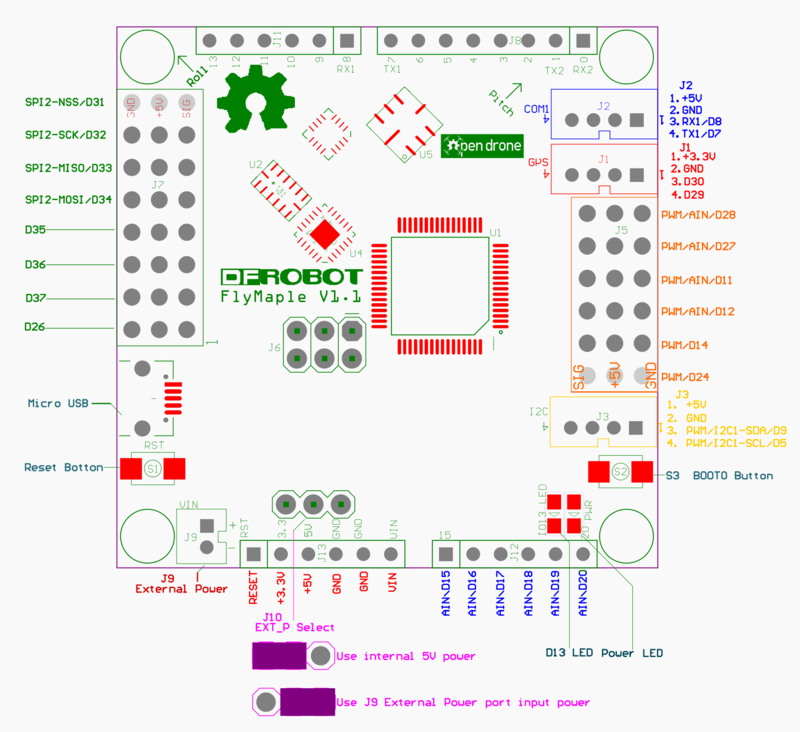 Get Flymaple V1.1(SKU:DFR0188) from DFRobot Store or DFRobot Distributor.